AI helps Magic Spreadsheet to auto-populate Google Spreadsheets. As a startup reviewer, not a week goes by when I’m not introduced to a new solution intent on burying the spreadsheet forever. Like weeds, however, spreadsheets keep turning up. That comparison may sound unfair, but, aside from email, it’s hard to think of a more reviled tool than the spreadsheet. And maybe it’s time to let go of our loathing. After all, if spreadsheets have enough inherent value that we continue to use them, couldn’t they be improved instead of abandoned? Is it possible for us to move beyond regarding the spreadsheet as a necessary evil? If you’re thinking it would take no less than magic to invoke such a change of heart, you’re close to the mark. 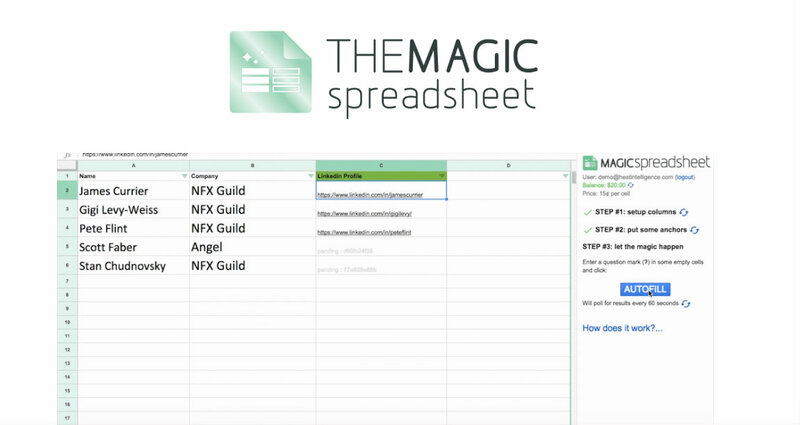 The Magic Spreadsheet, developed by HEAT Intelligence, uses a dash of AI sorcery to automatically fill your Google Spreadsheets. Getting started requires a more ordinary, but no less impressive magic. You begin by setting up your columns through step-by-step instructions in a side bar – to the uninitiated, beginning a spreadsheet is a tremendous hurdle, and Magic Spreadsheet clears this obstacle easily. Using plain English, you identify your columns and explain what information you’d like added. Then you enter some existing data to “seed” the spreadsheet. The example the website gives is trying to learn the LinkedIn profile URLs for contacts. After entering individual’s names and the companies that they work for, you’d then enter a question mark in the LinkedIn profile column. This is when the magic happens. Magic Spreadsheet then fills in the empty cells through AI and by distributing questions to different workers. It does the hard work for you. Should something remain empty or someone have a question, notifications appear within the cell. This keeps questions in clear view so it’s easier to resolve them. Magic is always better seen than explained. Watch the demos here. Other “tricks” the Magic Spreadsheet shows off include finding images and editing those images in just a couple clicks; and discovering which restaurants on a list make deliveries, without placing calls yourself. Not your average spreadsheet. Instead of merely entering information, you can gather desired information almost immediately and effortlessly. Abracadabra! If Magic Spreadsheet can’t lift the spreadsheet into good standing, nothing will. Find the Magic Spreadsheet in the Google Spreadsheets Add-ons Store or by visiting the company website here.